HERE, ISLAND ARTS and HERITAGE REALLY GET HANDS-ON. Red Sands Shore takes you along the lower half of the Central Coastal Drive. This route is named for the red sand and soil that make up its cliffs, tide pool beaches and heritage roads; it’s also the entry point to the province for anyone arriving via the Confederation Bridge. Here you’ll find coastal artisan villages, theatres, pastoral landscapes, artisans and galleries. This coastline also provides outstanding coastal cycling opportunities for everyone. The Central Coastal Drive takes visitors along the dune lined coast of the north and the red sand cliffs of the south and through all the pastoral landscape in between. 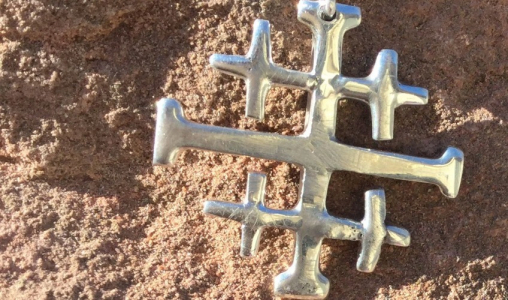 A Handmade Cross is Canada’s only handcrafted Christian jewelry shop. It’s filled with one of a kind jewelry and gifts. Silversmith Scott MacIsaac is a retired prison chaplain, whose skills turn silver, gold, brass, copper, wood, glass and stone into treasures that make statements of beauty and love. Drop in - say hello - look around, it’ll be fun.